Anyone who’s ever circled displays of pork rinds and Marlboros in search of a bodega money machine knows that finding quick cash in this town can be absurdly difficult. It shouldn’t be: Since the nationwide ban on convenience surcharges was lifted in 1996, the number of “independent,” or non-bank, ATMs has exploded. 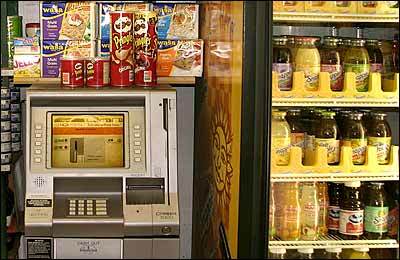 Today there are about 950 ATM locations in the city. And it’s Cliff Ransom’s job to find places for even more of them. He’s been ATM-location scouting for Universal Money since 2001. While placing his company’s $10,000 NCR 5670 mini-banks around town, he’s encountered machines wedged behind doors and hidden by coolers full of Snapple, and asked dozens of deli owners to move aside thickets of snack-food racks to make room. “You know those claw machines that kids use to try to win teddy bears? They’re my enemy,” Ransom says. “Kmart loves the claw machine, and they always put it in front of the ATM.” And then there’s the shopping-cart return area: “Sometimes you get a rat’s nest of ’em piled up around your ATM.” And that’s no good. Ransom considers his work akin to feng shui. “When you walk into a place, where do your eyes naturally go? How does the positive and negative space interact to lead you somewhere? You have to consider the flow of traffic and keep looking with fresh eyes again and again in order to optimize your ATM placement,” he says.